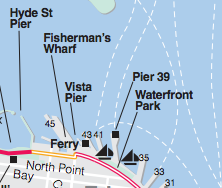 Today I continued my start-and-stop transit along the waterfront sidewalks of San Francisco, at a snail's pace. There were too many interesting spots to see and people to meet and photograph in this city. Despite the fact that I have walked through this (Fisherman's Wharf, Cannery) area between Pier 39 and Hyde Street Pier several times before, and that it has a reputation as a tourist trap, I still find it interesting. The Fisherman's Wharf area was relatively crowded for a Monday. Many people were out-of-town visitors. A group on segways zipped by on a tour, all slanting slightly forward. I had already eaten, so I didn't stop for a crab lunch this time around. 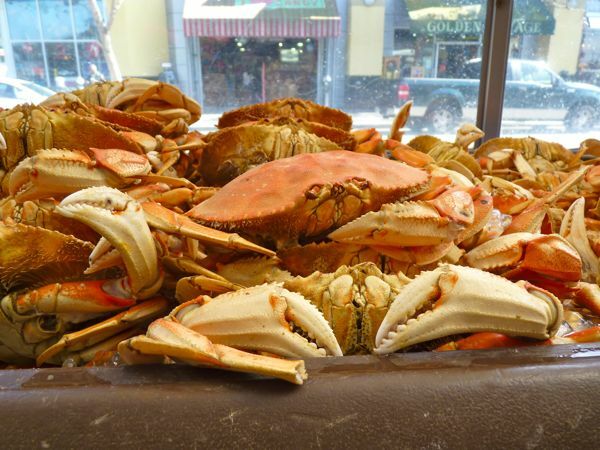 I did dawdle, however, to look at the crabs in tanks, piles of crabs, and crab dishes packaged up and ready to go. And I paused in front of Boudin's bakery window to look at a large loaf of baked bread in the shape of an alligator/crocodile. Street performers abound here. 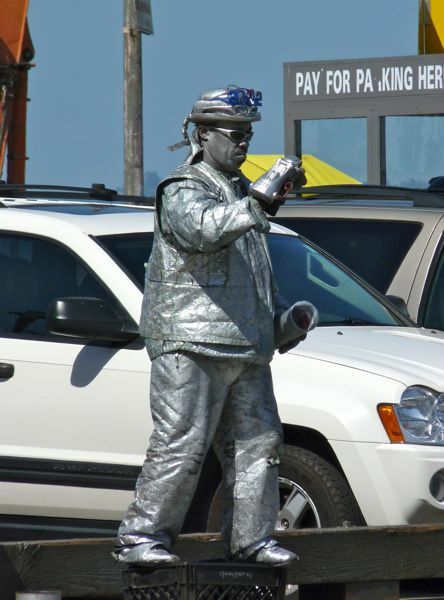 One man, spray painted from head-to-foot with silver paint, was perched atop a milk crate, moving robot-like; and the man who disguises himself as a bush and pops out to scare people periodically, was in the area. 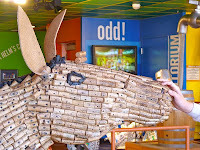 You'll also pass a Ripley's believe-it-or-not museum, where I saw a horse (or a donkey?) 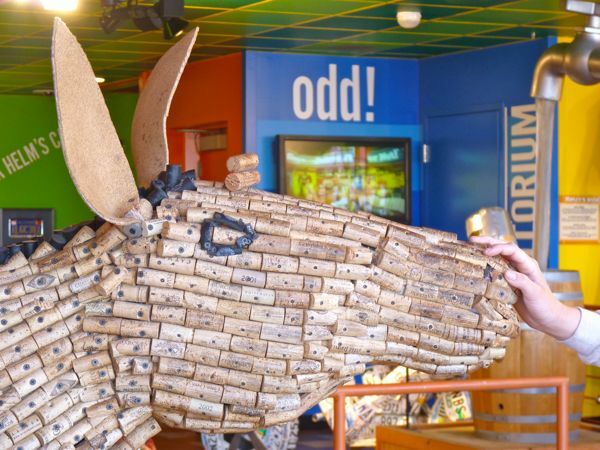 made entirely of bottle corks. 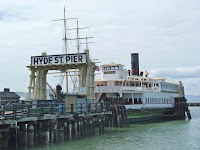 I turned around after I passed the Hyde Street Pier, an old ferry pier with several large historic ships moored there now. I walked down the this pier to look at some of these older ships/boats, but did not continue all the way to the end (admission required). Despite the activity in the area, I did see a great blue heron taking a snooze out on the rocks near the pier. 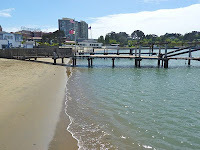 If you stand on the pier and look west toward Aquatic Park, you'll see a beach area, and may catch a glimpse of some bay swimmers from one of the swim clubs stationed nearby. I also stopped at Rosie's Roses, a shop on Jefferson Street, at the Cannery, a large brick building now occupied by shops and offices. I was looking for chocolate (for my other blog, Chocolate Banquet). In addition to flowers, plants and other items, she also carried chocolates. I passed many interesting small businesses like this along my walk. I always enjoy talking with small business owners. 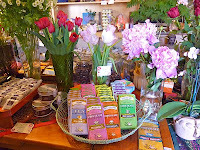 I came across this post after googling "rosie's roses" and I'm glad you found the shop as interesting and noteworthy as I did! 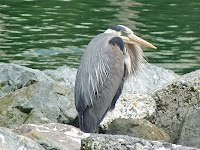 Hi Corinne, this is Kristal, whom you spoke with at the Maritime Museum on the afternoon of Friday, June 15. I enjoyed our conversation so much, I jumped onto your blog as soon as I got back to the office! Really great stuff and I'll be sure to check back often. Also, after reading this post, I wanted to let you know that you can indeed walk all the way down Hyde Street Pier without paying the $5 fee, which only applies if you want to board the ships. All the best with your travels, and see you in the park next time!